“Let food be thy medicine and medicine be thy food.” Hippocrates, an influential Greek physician in the history of medicine, was far ahead of his time by suggesting that food be used as a way to treat and prevent diseases. But this notion is easier said than done. Food and foodways are fundamental to the many different cultures in the U.S. While food is a social act that can bring comfort and enrich relationships between families, friends, and community, considerations about food as a source of nutrition sometimes tend to be overlooked. At CHFP, we partner with organizations who are dedicated culture shifters fighting to make healthy foods the new norm, particularly in neighborhoods that have little or no access to fresh fruits and vegetables. One of these culture shifters is Community Healthcare Network (CHN) in Williamsburg whose mission is to provide and make accessible high quality, comprehensive healthcare services for low-income and uninsured New Yorkers. Nutrition plays a fundamental role in their preventative care efforts as they work with patients to modify their behaviors and mindset to consider food as a type of medicine. Rachel Larkey, Community Nutritionist for CHN, provides one-on-one counseling to patients in need of nutrition services, including people with diabetes, heart disease, gastrointestinal issues, and general healthy eating concerns.Rachel is also the CHFP Site Coordinator for Community Healthcare Network. Rachel sees the partnership between CHFP and CHN as a way she can practice what she preaches. She mentioned that part of providing high quality, comprehensive healthcare is to provide stellar preventative care, and healthy eating is the biggest piece of that puzzle. Farm Share allows Rachel to provide firsthand the tools for her patients, staff, and community members to take an active role in their own preventative care. We are in peak eggplant season, people! Eggplant, like tomatoes, has long been misidentified as a vegetable, but eggplant is technically a berry. The fruit contains numerous small, soft seeds that are edible but taste bitter. There are many different varieties of eggplant. This week, some sites will be getting the traditional black fancy eggplants and some will get fairytale eggplants. 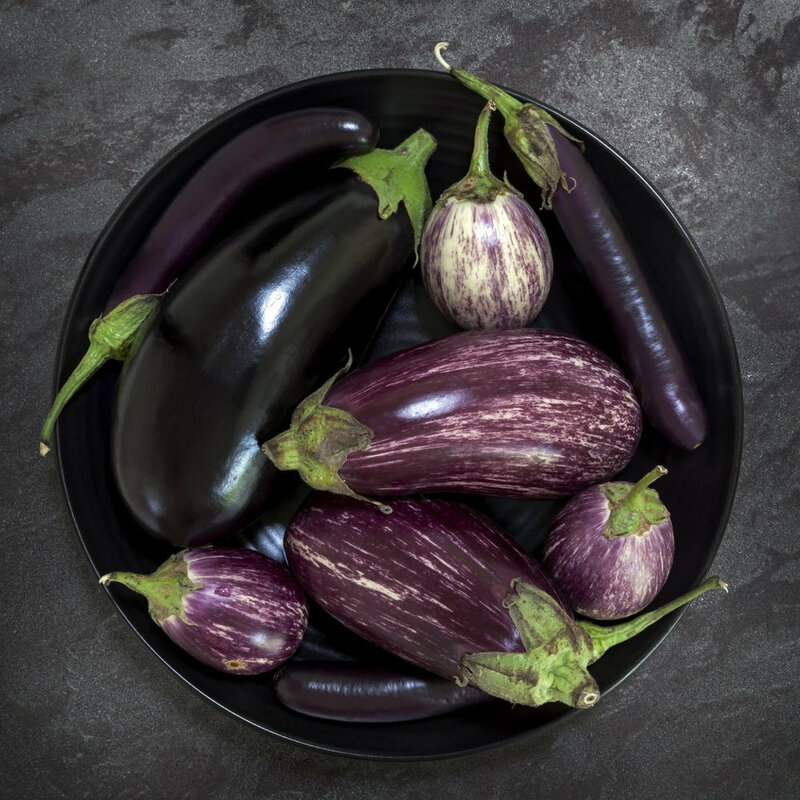 Whatever variety you get, eggplant will bring a wave of flavor to your dish! 1. Preheat oven to 350F. Place tomatoes and juices on a rimmed baking sheet and use your hands to break tomatoes into ¾-inch pieces. Drizzle with 2 tablespoons oil and bake until thickened, 30 minutes, stirring every 10 minutes. 2. Meanwhile, in a colander, toss eggplant with 1 ½ teaspoons salt. Let sit 20 minutes, then squeeze out excess liquid. 3. In a large Dutch oven or heavy pot, heat 4 tablespoons oil over medium. Add onion and cook, stirring occasionally, until translucent, 5 minutes. Add garlic and cook until onions and garlic are soft, 5 minutes. Add peppers and cook, stirring, until crisp-tender, 4 minutes. Season with salt and pepper. 4. Add tomatoes, eggplant, zucchini, bay leaf, and marjoram to pot. Cook, stirring occasionally, until mixture comes to a simmer. Reduce heat to medium-low, partially cover, and cook at a gentle simmer until vegetables are tender but not mushy, 15 minutes. 5. Season to taste with vinegar, salt, and pepper. Remove bay leaf before serving. 1. Heat oil in heavy, large pot over medium heat. 2. Add eggplant, onion, and garlic cloves. Sauté until eggplant is soft and brown, about 15 minutes. 3. Add diced tomatoes with juice, then red wine vinegar and drained capers. 4. Cover and simmer until eggplant and onion are very tender, stirring occasionally, about 12 minutes.